Buy Mephisto Genetics The White Train Auto Feminised Seeds from dope-seeds.com today for the best cannabis seed prices online. Mephisto Genetics produce some of the finest autoflowering cannabis strains in the world using their expert knowledge of autoflowering genetics to produce incredible plants. 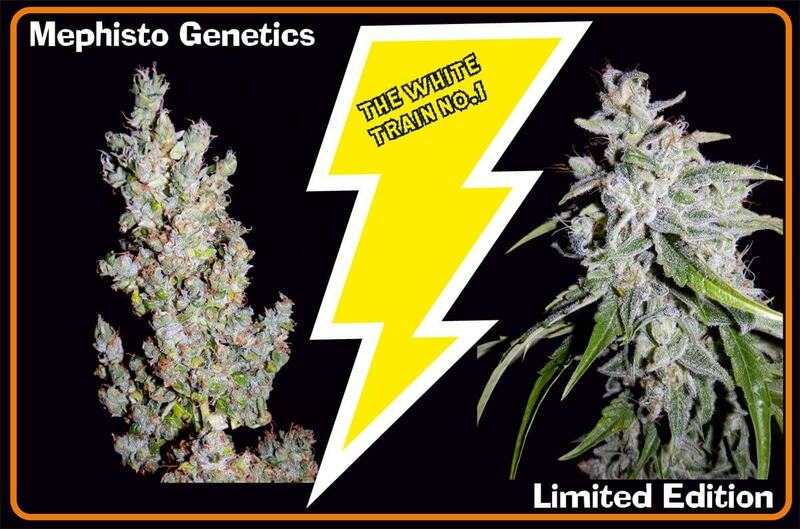 The White Train is a limited edition combination of two of Mephisto Genetics newest strains! In the red corner is Walter White, a beautiful snow covered powerhouse, in the blue corner is Fantasmo Express their most sativa dominant creation. Both compliment each other, the Walter white’s overall high quality brings even more resin and denser flowers to the Fantasmo, which in turn adds extra vigour and budsites. The White Train is a good strain for training and playing with to optimise yield. Expect this to be one of the best hybrid autoflowers you can grow. Big yields of amazing quality flowers are possible.